Will BJP’s Sops, Promises Make Drought-Hit People Of Kutch Vote Lotus Again? Water is the only election issue in the 97 villages of Rapar block and much of Kutch as the district experiences the worst drought in over 30 years. Dressed in white shirt and trouser, Bhaggabhai Ahir is hard at work at the dusty and wind-pummeled fodder distribution centre at Adhesar village in Rapar block of Kutch. As the sarpanch of Adhesar, on the edge of Kutch district’s Little Rann, Bhaggabhai is busy issuing instructions and overseeing the distribution of fodder as ramshackle tractors and vans with gnashing gears and smoke-billowing exhausts enter the complex where villagers have gathered to purchase feed for their cattle. Overhead, the merciless sun beats down on the village men—and some women—who contemplate when, and if, it might rain this year. Wiping rivulets of sweat streaming down his temples and cheeks, Bhaggabhai agrees that the situation is bleak—for humans as well as animals. “The past 10 months have been extremely difficult. There has been no rainfall since July last year. Though the crops failed, we are fortunate that there is sufficient drinking water that villagers have stored in their homes, thanks to the tankers that bring in water from the Naramada canals,” he said. The average villager of Adhesar is not too bothered about the Balakot strikes by the Indian Air Force. The villagers acknowledge that demonetisation had hit many of them quite hard, but that “nightmare” is behind them now. Nor are they concerned with the Rafale scam. 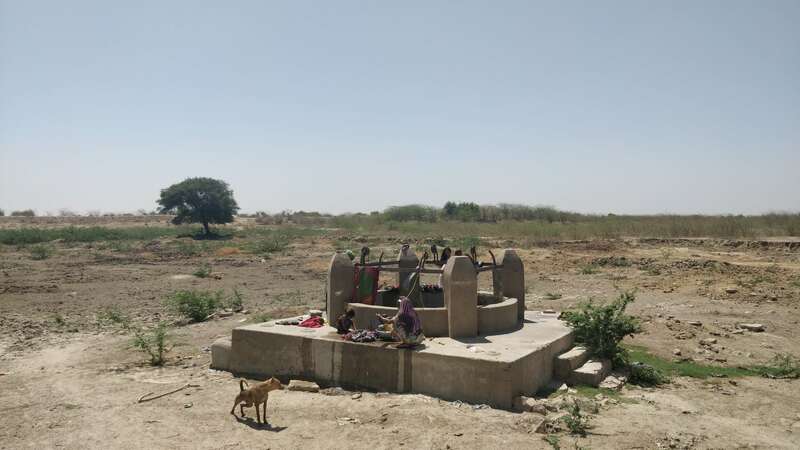 ‘Water’ is the only election issue in Adhesar and its surrounding villages — as Rapar block’s 97 villages and much of Kutch remain in the grip of the worst drought in more than 30 years. But even as Rapar block development officials acknowledge the extended ‘dushkaal’ (drought), a defensive BJP leadership in Gujarat and bureaucrats in Gandhinagar characterise it simply as “water scarcity” — as they prepare for the Lok Sabha elections to be held on April 23, across all 26 seats in Gujarat. Also read: Severe Droughts to Go Unreported? A few hundred metres away from the fodder distribution centre stands a massive gaushala (cow shelter) where cows and buffaloes mill about, ruminating on scattered fodder or drinking water from the concrete troughs. Beyond the bounds of the cattleshed, 65-year-old Ismail Osman, wielding a not-so-menacing stick, rests on a makeshift charpoy under a pilu fruit-bearing tree. As the chowkidar of Pirwala talav, spread over about 15 acres, Ismail’s job is to not only guard against water pilferage and drive away cattle. He also guards against the village’s women who try to sneak in to wash clothes at the pond, which is meant exclusively for human consumption. Ismail respectfully acknowledges that Bhaggabhai was “kind enough” to appoint him as the talav chowkidar, though after some consultation with the deputy sarpanch, a Muslim. The pond, fed by Narmada waters brought in via canals, was desilted in October-November last year by Samerth Charitable Trust, an Ahmedabad-based NGO that has been involved in participatory water management and related intervention programmes for the marginalised communities living in this parched region of Gujarat, where summer temperatures can rise up to 47 degrees Celsius. Samerth’s programmes are spread across not just a few villages in Rapar but beyond — in the backward and rustic hamlets (called vaand in Kutchi) scattered along the edge of the hostile and dreaded Rann. “At a time when most of Kutch, especially Rapar and Bachau blocks, is reeling under the impact of drought, the region’s farmlands are being left fallow and unusable because of the sure and steady ingress of ground-water salinity, causing the villagers to abandon plots of land which were cultivable until some 15-20 years ago,” said Ashish Mehta, programme officer at Samerth Charitable Trust. But for the villagers across Rapar block, the real shock is being felt now after a 10-month-long rainless period. After the monsoon’s no-show last year, and with the election looming large, the BJP government led by Chief Minister Vijay Rupani panicked and announced a one-time relief for farmers to tide over last year’s crop failure. Depending on their respective landholdings, farmers have been paid compensations, ranging from Rs 6,000 to a maximum of Rs 13,600. “The villagers are happy with the compensation,” Bhaggabhai said, indicating that even this meagre government intervention is enough to prevent an electoral—if not a farm— calamity in Kutch. Standing by the steps leading down to a 400-year-old stepwell, which was revived and reoperationalised by Samerth, Bhaggabhai, who does not conceal his support for the BJP, is also transparent about the grim human consequences if it does not rain this monsoon season. “We are in for big trouble,” he said. Bhaggabhai’s spartan office in the panchayat building doubles up as a hang-out for sundry supplicants. Pulling up Dayabhai Rabari from the dusty floor on which he was sitting and placing him on a chair next to his own, Bhaggabhai prods him to respond to our questions. “I and some others from my community will vote for whichever party the sarpanch tells us to vote for,” said 50-year-old Dayabhai, who is illiterate. Ten years ago, he sold off some cattle to pay for hospital bills when he fell seriously ill. Five years before that, he sold off a couple of thoriya (traditional, gold ear pieces that members of the shepherd community, which he belongs to, wear). After last year’s crop failure, he received Rs 6,000 as compensation which he has already withdrawn from the bank and spent. Though steeped in debt, Dayabhai will likely follow Bhaggabhai’s suggestion and cast his vote for the ‘lotus’ symbol. After all, he said, “pani aayo, gas aayo”, referring to BJP’s programme to supply Narmada water and cooking gas. In Adhesar and most other villages in Rapar block, joblessness and underemployment is directly related to illiteracy or semi-literacy. So, 24-year-old Panchanbhai Rabari, who like Dayabhai is unlettered, does the job of shepherding his community’s 60 odd cattle, for which he is paid Rs 6,000 a month. While Panchanbhai has no land—which means no compensation for crop failure—Ratnabhai Ahir (60), received his share of Rs 13,600 some 20-30 days ago. “This is not sufficient and now we have to work on others’ fields to make ends meet. Had there been normal rainfall last year, I would have made about Rs 50,000 from selling the produce,” said Ratnabhai, a widower. After withdrawing the entire compensation amount, he is today left with no money in his bank account. And yet, he said in his guttural Gujarati, he would go along with the sarpanch’s political preference. Nature’s vagaries have compounded the people’s hardships in the form of the “tanker raj” — a powerful water mafia and diversion of drinking water for irrigation purposes. “I haven’t experienced such drought conditions ever. Of the 97 villages in Rapar block, only 17 villages are getting water from the Narmada and the rest are dependent on check dams and talavs (ponds). The supply of fodder, though patchy, is from Valsad and Surat. The hardy and tough Kutchis are being able to just about tide over this grim situation by saving on grain and fodder,” assistant BDP M D Parmar said. The condition of the people on the peripheral hamlets closer to the Greater Rann is worse. While most of the Narmada canals in these zones are dry, some of the village folks make do with underground water tanks—water harvesting structures—with 15,000-litre storage capacity. At Dungrani vaand, the last hamlet in Dholavira village before the vast expanse of the Greater Rann begins, these ‘water harvesting structures’ are the only sources of water, especially when the nearest Narmada canal is 35 km away at Amrapar. Earlier, two BSF camps supplemented the vaand residents’ water needs, but this stopped after there was no rainfall last year. “About 15-20 years ago, we would walk five miles to fetch water for daily use. This has stopped now because of the underground tanks built about a year ago. While we make do with the stored water for drinking purposes, there is very little to spare for harvesting. We bathe alternate days or sometimes every few days,” said Shantiben Koli (35), of Dungrani vaand. The last time the vaand’s womenfolk walked the 2.5 km to the Ajna Dada shrine on the edge of the Greater Rann, they had a silent prayer on their lips: let there be some rains this year. The writer is an independent journalist. Velusamy, a weaver from Tirupur has gloomy memories of demonetisation. “I used to weave for mass weavers for a fixed coolie [wages].